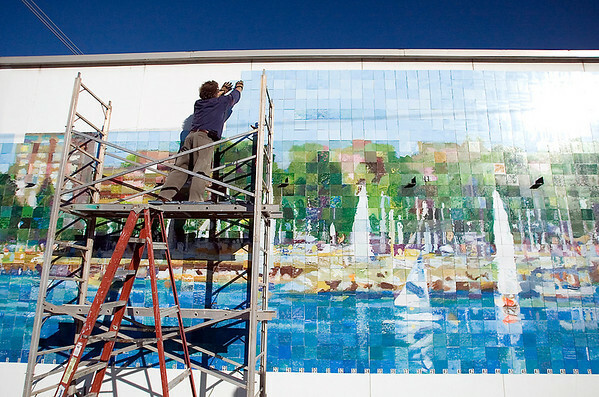 Artist Terry Dickinson (cq) places the last few tiles on the Community Mural Mosaic Project Tuesday morning on the South wall of ACE Hardware on West Front Street. There are 2,600 six-inch tiles on the 13-foot-by-50-foot mural, designed by a professional artist and painted by members of the public at a number of area events under assistance from professionals. Dickinson directed the project, which was initiated by Artcenter Traverse City. The center will host a party Saturday, Nov 6, 2010, at the mural starting at 3 p.m.